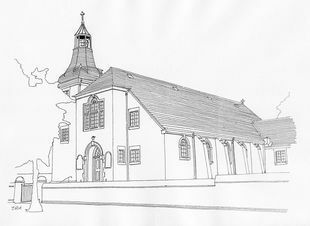 Rosyth Parish Church stands at the heart of Rosyth, built as a Garden City when the Royal Naval Dockyard was developed in the early 1900s. The church was designed in 1930 by Hugh Mottram a pupil of Raymond Unwin the developer of the Garden City concept. The building is reminiscent of Dutch Architecture, with its square tower and steeple finished with a teak belfry, and copper roof crowned by a cross. The nave, 80ft by 40 ft wide is spanned by an open timber roof with a wide arch at the west end which leads to the apse. The later Church Hall extension of 1954 was also designed by Mottram, and the 1968 extension by D White & Associates. The church is currently closed for a major programme of repairs and refurbishment.